Susun shows us goji berry tincture. Goji berry is The adaptogenic herb to help the eyes. Also good for circulation and heart health. No snow on the ground means we can celebrate the Return of the Light with a wild salad. Here’s what went into it. What will you put in yours? Wild Chives: are available all winter. Minced finely, they wake up winter taste buds: I add them to salads or baked potatoes or mash into butter. Cronewort (Artemisia vulgaris): is sending new leaves up from its rhizomes. If you want less cronewort in the garden next year, pull up the rhizomes with their leaves, rinse the dirt off, and chop into the whole thing into your salad, or make them into a delicious vinegar. Catnip (Nepetaria cataria) and other mints, such as lemon balm, thyme, rosemary, and bergamot, may be hardier than you think. Take a look around and see which of the mints is still green. A leaf or two, finely minced, of any tasty mint – yes, there is lots of motherwort, and it’s a mint, but it’s too bitter to be considered tasty – adds zip to winter salads. Mallow (Malva neglecta) thrives in the cool weather, which always strikes me as odd, since most of the plants in this family are tropical, like hibiscus. As you can see, this mallow is spreading wide and even blooming. I suppose the bees are flying when the sun shines and the temperature is warm enough, so why not bloom?! There are plenty of bland tasting, respiratory-strengthening leaves to be had for many months for cold-weather salads. 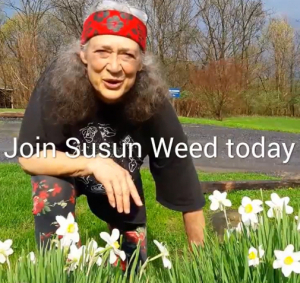 Susun answers 90 minutes of herbal health questions followed by a 30 minute interview, Active Culture Yaya Erin Rivera Merriman . • eat gluten unless you have celiacs- gluten is not dirty..
Susun answers 90 minutes of herbal health questions followed by a 30 minute interview, Women of Wisdom Lama Tsultrim Allione .